Who doesn't love this tale by the Grimm Brothers? Enhanced in this narrated version are all the raucous animal sounds and rough-and-gruff robber exchanges that we imagined while listening to the story as children. 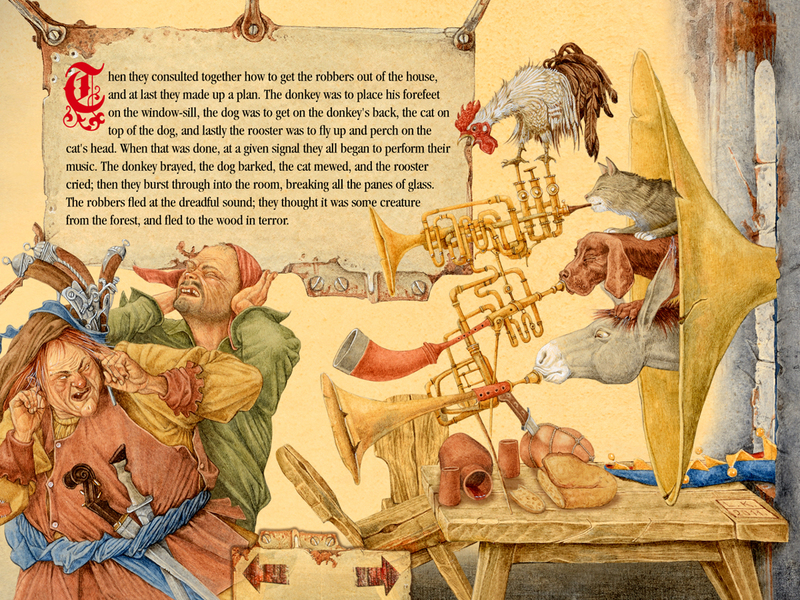 A wonderful old folktale by the Brothers Grimm is elaborately illustrated in this traditional, yet interactive telling. Users may swipe, tap, or tilt to experience Town Musicians of Bremen (Albert Frischmann, iOS, $.99; PreK-Gr 3). Each screen/page of descriptive text features numerous animations (the developers boast some 800-plus) and sound effects. Navigation is sequential; with a touch to an arrow, viewers can advance forward or backward. However, with each movement a “loading” page appears briefly, potentially frustrating viewers. There is no way to return to a home screen until finished with the tale.